The days of China’s PV production being purely for export are coming an end. 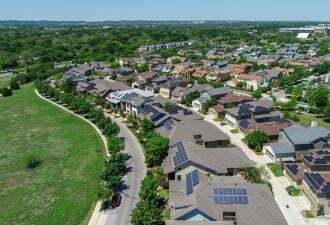 What’s the impact on the PV industry? What do the U.S. and China solar markets have in common in 2011? Well, for one, this is the year that both the U.S. and China markets clear the one-gigawatt hurdle of annual installed solar. The U.S. crosses that line sometime in September and China will cross that line on about December 31, according to the intrepid solar analysts at GTM Research. Suntech's Chief Commercial Officer, Andrew Beebe, said he expects China to be a "multi-gigawatt market" in 2012. In an article in Financial Times, Yingli Solar's Chairman and CEO Mr. Liansheng Miao was quoted as saying, “We strongly believe that China will quickly evolve into one of the largest and most important solar markets in the world." China has long surpassed the United States in funding for green technology and is discussing a "campaign to limit the absolute amount of greenhouse gases that can be emitted by certain industries in certain regions," according to a senior climate official, as reported in the China Daily. China's government has plans to expand its installed capacity to 20 gigawatts by 2020 -- a feat that will be enabled by a recently instituted solar feed-in tariff. That 20-gigawatts-by-2020 figure has a tendency to be rather, um, fluid, and certain solar analysts like Amy Song of Goldman Sachs have characterized the FIT as "temporary." 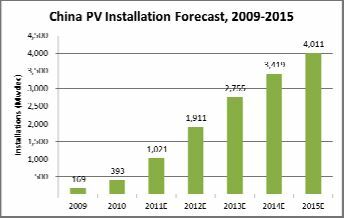 At any rate, China could surpass the U.S. in installed PV within a year or two. China's cumulative capacity will double this year to two gigawatts. 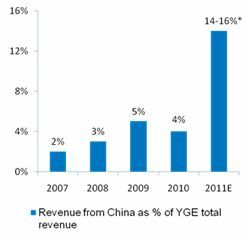 Here's more on the feed-in tariff from Suntech's Beebe at the firm's second quarter earnings report: "The government recently announced China’s first-ever national feed-in tariff set at 1.15RMB per kilowatt-hour [about $0.18 per kilowatt-hour] for projects approved in the first half of 2011. 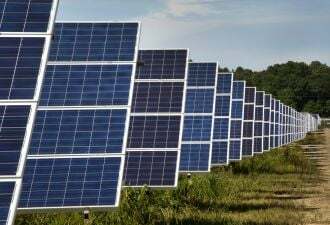 While quite low by international standards, this tariff is sufficient to attract investment, particularly in utility projects in the western provinces that enjoy rich solar resources." 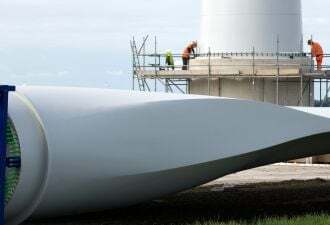 Funding for the FIT is furnished by China's Renewable Energy Development Fund with legislation by the National Development and Reform Commission (NDRC). 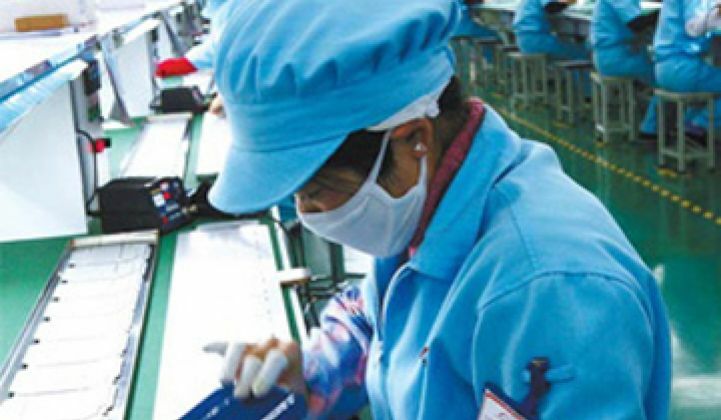 The FIT will benefit Chinese suppliers such as Trina Solar, Suntech, Yingli, Jinko, LDK, and JA Solar, as well as other Asian suppliers such as HanWa Solar One. Jigar Shah, CEO of Carbon War Room and the founder of SunEdison, had this to say about the feed-in-tariff: "[It m]ight be big in 2012 but it's not important. They set the FiT so low that only Chinese module manufacturing can compete at very low "dumping" margins." Here's a list of some of Suntech's projects in China, according to a company spokesperson who emailed Greentech Media. And here's Yingli's forecast of how much a percentage of their business they expect from their home country, from their most recent quarterly call. According to Goldman Sachs, China added 35 gigawatts of new generating capacity in the first half 2011, adding: "Ultimately, China’s appetite for power will drive long-term growth." This demand for power is occurring across all industries and in commercial as well as residential sectors. The total growth in generating capacity is forecast at 84 gigawatts. What is the impact on the solar industry when China becomes one of the larger end-users of photovoltaic modules? What is the impact on trade issues? And how will American suppliers like First Solar, SunPower, GT Advanced Technologies, and MEMC fare in this new China-as-end-user era?